Mike Jackson has responded to recent challenges laid down by Daniel Bryan and Aaron Chalmers. 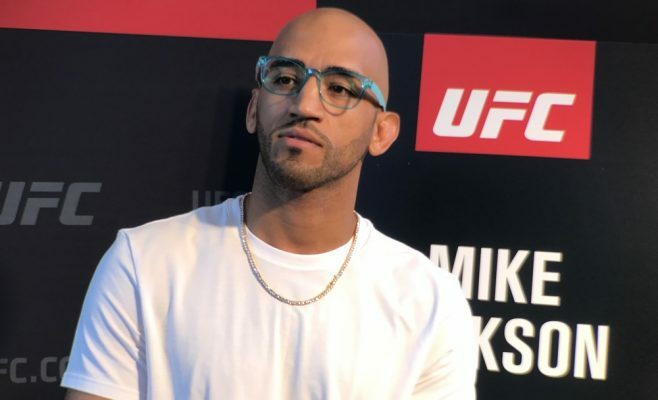 Mike Jackson has received no shortage of attention since beating CM Punk at UFC 225 with the likes of WWE star Daniel Bryan and former UK reality TV star Aaron Chalmers both exchanging words with him across social media. Jackson’s position with the UFC is currently unclear following Dana White’s reaction to his win over Punk, but as it stands his contract with the promotion remains intact and he is still a member of the UFC roster. Speaking on the Slip n’ Dip podcast this week, Jackson responded to Byran’s comments. “Well Daniel Bryan, you’d have to get me down the ground first and I’m pretty sure I’d break his neck. That’s just what it is. He has a weak neck. It’s not a knock, that’s just the reality of it. Not long after Bryan’s call out, Bellator fighter Chalmers asked on Twitter whether his fans would like to see him fight Jackson. When asked what he made of that, Jackson said he didn’t so much have a problem with the idea of them fighting, but more the fact that he didn’t know who Chalmers was and why he didn’t tag him in the original tweet. “Then it turns into I called him out, but I don’t even know [who he is]. “All I said was ‘you could’ve at least tagged my name’ and now I’m the bad guy, again. “He was then like ‘you either want it or you don’t,’ but I didn’t even call you out. I’m just trying to figure out why you didn’t tag me initially. That was it. “People are like ‘this guy is calling you out,’ but we’re in two different promotions. He’s in Bellator and I’m in the UFC so I don’t understand why people are calling me out when they aren’t even in the UFC.